Firefighters stand outside Rick's All Seasons Restaurant in York, where a fryolator exploded last week, sending two people to the hospital. 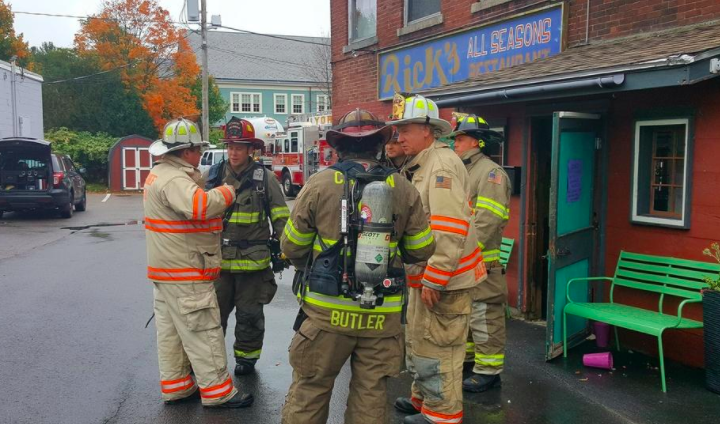 YORK, Maine — Rick’s All Seasons Restaurant is expected to open sometime this week, following a small kitchen fire on Oct. 11 that sent two people to the hospital. 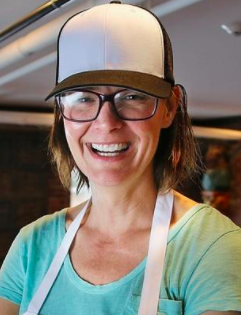 Restaurant owner Veronica Gould has also started two GoFundMe campaigns to raise money for the employees. A propane-powered fryolator burst into “a ball of fire” just before 11 a.m. that morning, said York Village Fire Department Chief Chris Balentine, but was quickly extinguished by a sprinkler system in the popular York Street eatery. Balentine said one burn victim was standing at the fryolator and one was standing nearby when the flash fire erupted. Both were transferred to Maine Medical Center, he said, with “non-life-threatening, but serious” burns. The second employee, Marianne Porter, “experienced substantial burn injuries to her face and hands. As a mother of two, we would like her to be comfortable taking her time to heal,” states the GoFundMe page. Balentine said later that he believed there was a buildup of propane in the line, and “it exploded with an unknown ignition source.” The state fire marshal’s office has been called in because the fire resulted in a workplace injury. The town’s health officer is also involved in the investigation. When firefighters arrived at the scene, the restaurant’s sprinkler system had already activated in the kitchen area of the restaurant. At the scene, a strong smell of propane gas permeated the area outside of the restaurant, and the fire alarm had been activated. Balentine said water damage was confined to the kitchen area, which has a concrete floor. York Beach Fire Department also responded with its ladder truck, but was released after 20 minutes or so to return to the station. Gould opened Rick’s in the fall of 2016. The restaurant sat vacant for some time following a fire in the Realty Building, where it is located, in August 2015. To support McDowell, visit https://www.gofundme.com/breeanne-mcdowell-the-ricks-chicks; to support Porter, visit https://www.gofundme.com/the-ricks-chicks-porter?member=938496.